After the death of Moses, the Israelites rejected the homeland shown to them which was in north-western Yemen and Asir region (now in Saudi Arabia). They forged the scriptures because their greedy leaders preferred Canaan. Moses died leaving behind his widow, Zipporah, and two sons (Gershom and Eliezer), plus a community of faithful Israelite. Zepporah, her sons, and a group of faithful surely had rejected the alterations made to the scriptures and refused to join the malicious wandering. Those who disobeyed Israelite leaders and held to Moses’s teachings must were a minority. Moses’s widow Zipporah and her two sons were also not accepted by Aaron and Mariam. They must had had no choice but to return back to their homeland in Habesha soon after the death of Moses. Zepporah’s father was Jethro, and her brother was Reuel, and had six sisters.. It makes a lot of sense to assume that the Israelite leaders during the 40 years of Wandering were either terrified from the Ark of the Covenant or unwilling to take it with them in their deliberate unfaithful acts of defiance by invading Canaan. Israelite who invaded Canaan didn’t have the genuine Ark of the Covenant at all, instead they made and used a duplicate only. 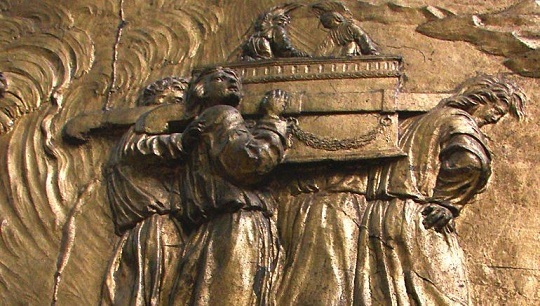 The Ark of the Covenant, also known as the Ark of the Testimony, is a gold-covered wooden chest with lid cover containing the two stone tablets of the Ten Commandments. The Ark disappeared mysteriously. The original Ark of the Covenant was either hidden or left behind in Yemen or taken by the group of faithful Israelite who returned to Habesha with Zipporah and Moses’ children. This small Israelite community in Habesha were the founders and the keepers of the true religion of Moses. Therefore, according to many stories, what King Menelik (son of King Solomon and Queen of Saba) brought from Solomon’s Temple probably was a duplicate because the original Ark of Covenant was already hidden either in Yemen or most likely somewhere in Habesha. This kind of refuge and protection in the Habesha that was offered to the faithful Israelite was also provided for the followers of Jesus in early Christianity during the Jewish persecutions against the Hebrew Israelite. Again Habesha protected the followers of Mohamed at the beginning of Islam and after the eruption of the civil war. 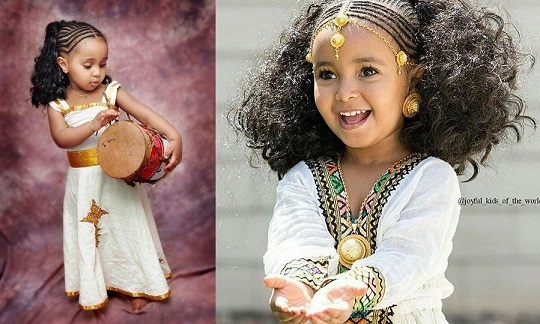 Habesha could be the only holder and protector of the “Backup copies” for the original religions. Enoch the Ethiopian is a less known prophet of the Bible but he was greater than Abraham and holier than Moses. Enoch was the son of Jared (Genesis 5:19–21), the father of Methuselah, and the great-grandfather of Noah. The Bible says that Enoch lived 365 years before he was taken by God. The text reads that Enoch “walked with God: and he was no more; for God took him” (Gen 5:21–24), which some Christians interpret as Enoch entering Heaven alive. The Hebrew Book of Enoch informs us that he was taken from this world because of his perfect righteousness and in his capacity as the perfect witness. The real stories of Moses, Zepporah and their children, the faithful Israelite community that opposed the alteration of scriptures to legitimize the invasion and colonization of Canaan cannot be found in Hebrew history. The reasons for such omissions are not necessarily racist, but more probably political and related to the legitimacy of the state of Israel; and also destroying the claim of Jews, who were brought by the Turkic Mongolians who ruled Persia, that they are equally Semite as the Hebrew Israelite who they displaced since 530 BC.